Snow Blind consistently throws cria that are true to the dam's color, including black! There are very few Accoyo herd sires that will produce color so on that alone he's worth checking out! July 28, 2018: Our sweet Tiramisu died on our farm - she was almost 15 years old. 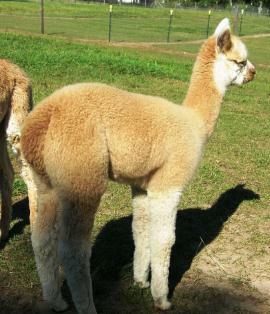 Tiramisu aka Misu was purchased as a maiden as part of our foundation herd from Alpacas Of America to bring rare genetics to Michigan - original purchase price $19k. 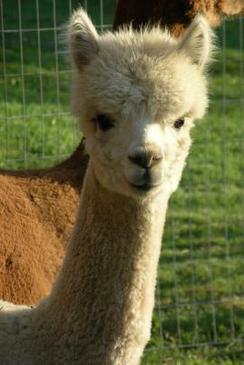 Her first cria was our True Black herd sire, Fortune's Shadow. View his certificate populated with color pics of ancestors - this is a color genetics line. Misu's second cria, a light fawn beautiful female named Loretta, sired by Snow Blind, a white 3/4 Accoyo son of legendary import stud PPeruvian Royal Fawn. We were so pleased with Loretta that we rebred Tiramisu to Snow Blind, and she produced a male with his dam's fineness, rich brown color, black points and white stockings. He was so vigorous and striking racing around with those white stockings like a little race horse, we named him Colt. Misu was bred to True Black studs three times, producing True Black cria each time - one male and two females. Black Velvet and Little Black Dress are two examples of what Misu produced when bred to black. 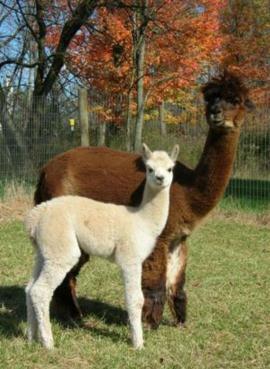 Black Velvet's first cria was another true black, a show-quality female named Summer whose fleece won Dark Color Champion under AOA Judge Wade Gease in 2016. 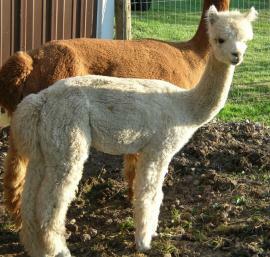 Tiramisu produced large, vigorous cria and was a good mother with plenty of milk. She was also a gentle female, a bit on the shy side having come from a very large farm. Her offspring have proven to be easy to handle with gentle dispositions. She was bred to MFI Natural High seeking increased density passed down through the Magical Farms herd sires. Natural High is a son of Peruvian Dakotia, half-brother to the renowned MFI Peruvian Jericho, and grandson of Peruvian Bueno. Natural High has the conformation, phenotype, fiber, crimp, density, and fineness to produce outstanding crias, and he sure did with Loretta!